My family spent a wonderful sunny Sunday afternoon, this week, in the Tusquitee Ranger District of the Nantahala National Forest just west of Murphy. Our first stop was the Panther Top Lookout tower on Forest Service Road 85. The 30-foot high former live-in tower was constructed in 1940 by the Civilian Conservation Corps. 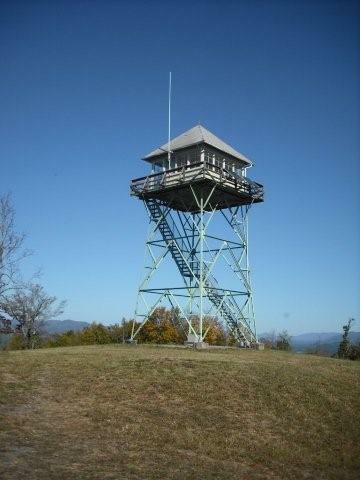 Panther Top is the western most fire tower in the state. Its 2,293 feet elevation will fool you. In fact when we arrived at the summit, Denise remarked, “It’s like we’re at the top of the world.” The illusion is created because you are overlooking low-lying valleys all around with mountains in the distant background. I’ve been doing spring bird-point counts for the Forest Service in the Tusquitee District for four years now and almost every fall I get back for an afternoon to look for migrating raptors simply because there are a couple of places where you can see lots of sky. In the past I have focused my attention on the north end of the Beech Creek Seed Orchard. And each trip has resulted in a few migrants. I believe the biggest day was between 30 and 40 broad-winged hawks and three bald eagles. This trip I decided to scope out the fire tower. After about 20 minutes I caught a bald eagle that was already south of the tower and watched as it continued to track to the south – southwest. It was probably another half-hour of scanning the skies, watching little girls gambol on the grassy knob and tracking butterflies that danced over the bald (a couple of monarchs, some sulphurs and great-spangled fritillaries and two black swallowtails) before I found two more black specks through the binoculars. These were so far in the distance that I couldn’t find them without the bins. But as I watched them circle and glide they came nearer and nearer till we could make them out with the naked-eye and soon there were five broad-wings that lazily circled and then streamed off to the southwest. Soon after the hawks another mature bald eagle appeared and as it circled the sun sparkled brilliant-white from its head and tail. I lost this bird and don’t know if it was migrating or checking out the drawn down Hiwassee Reservoir for a meal. We left the fire tower and went to a spot where there is a colony of redheaded woodpeckers. We played a tape and soon three redheaded woodpeckers were over the truck checking us out. It was getting late for migrants, around 5 p.m. when we left the woodpeckers and made one last stop in the seed orchard. We didn’t add any raptors to our list but did see one more migrant monarch and one bright, fresh Gulf fritillary. All in all a wonderful Sunday afternoon.